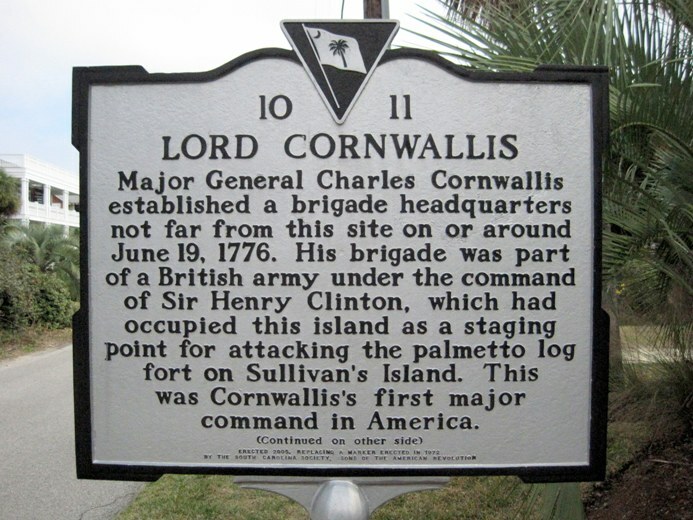 BRITISH ATTACKING ACROSS BREACH INLET Major General Henry Clinton, Lord Charles Cornwallis, and Brigadier General John Vaughan planned to attack Sullivan’s Island from Long Island (now Isle of Palms). This historical marker is at 120 Charleston Blvd on Isle of Palms. In early June, the army disembarked from ships on the far (north) end of the wilderness island. They moved to the southern tip of Long Island across from Sullivan’s Island and set up camp in woods beyond the beach. They scouted the area and took soundings to find the depth of water in the creeks and inlet. They soon discovered that the channel through the inlet was seven feet deep, not 18 inches as previously reported. Wading across was not an option. Instead, they would have to cross by boat. PATRIOTS DEFENDING BREACH INLET Colonel William “Danger” Thomson formed his 780 men into an Advanced Guard at this location. The force was spread about a mile across the island to keep the British from crossing the inlet. They hastily built fortifications of palmetto logs and sand and dug two lines of entrenchments in the dunes and myrtles on the bank overlooking the inlet. They were provided two cannons, an 18 pounder and a 6 pounder, which they aimed at the likely British avenues of approach. The Battle of Sullivan’s Island illustrates the variety of Americans who fought on the patriot side during the Revolution. 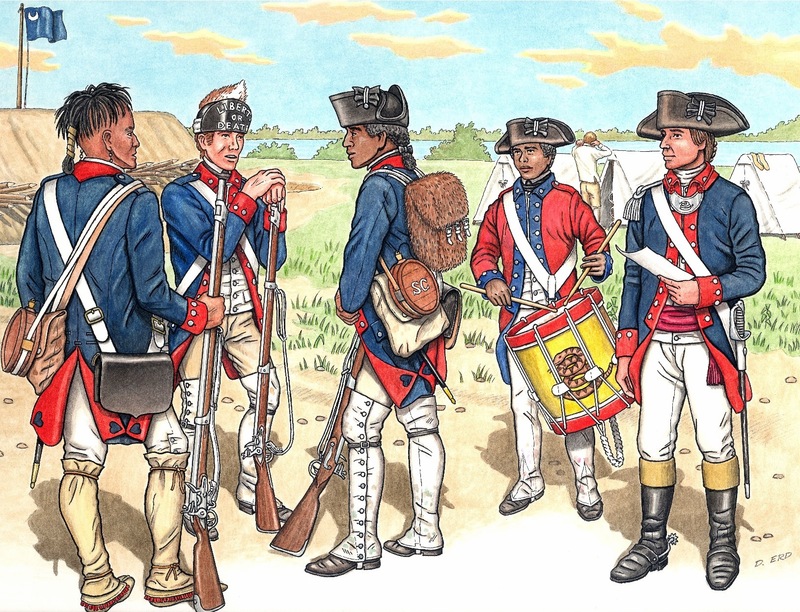 CONTINENTALS were regular troops in the standing army. They typically joined for three years or the duration of the war. Most were issued weapons and uniforms. They were the best trained and best led American troops, similar to the British regulars or “redcoats”. Moultrie’s 2nd Regiment and Thomson’s 3rd Regiment of South Carolina (Rangers) began as provincial/state troops and joined the Continental Line shortly after this battle. PROVINCIAL OR STATE TROOPS were similar to today’s National Guard. They enlisted for a specific timeframe and often were issued uniforms by their state. South Carolina’s units involved in the Battle of Sullivan’s Island were state or provincial troops at this early stage of the Revolution, before they were incorporated in the Continental Line. The reinforcements from Virginia were state troops adopted into the Continental Line as they marched to Charles Town. MILITIA were civilians called to duty for specific purposes. They usually wore civilian clothes and were expected to furnish their own weapons. The local militia mustered and trained only occasionally, yet they were instrumental in success of the Revolution. Many patriot military leaders such as Colonel Thomson and Colonel Moultrie were militia officers before the Revolution. 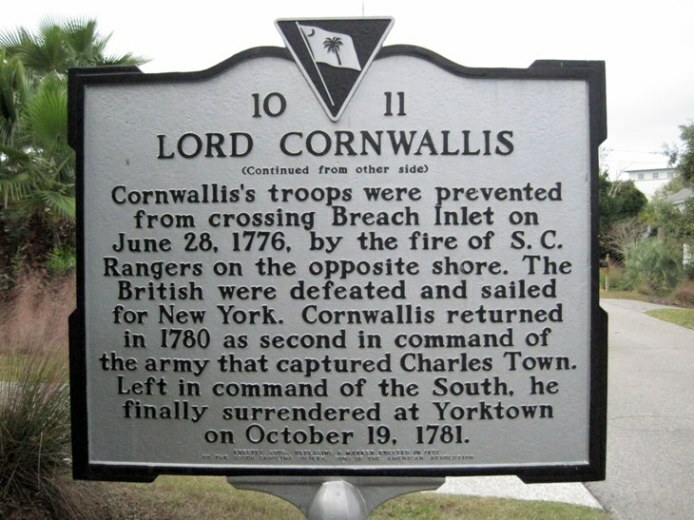 Militia units from all sections of South Carolina rushed to defend Charles Town in 1776. “Brothers in Arms: The Third South Carolina Regiment, February 1779,” by Darby Erd, 2005. Painting copyright © 2005 by the Culture & Heritage Museums. The patriots at Breach Inlet would have been wearing at least some of these uniforms. It should be pointed out that the historical markers shown at the top of this page are on land the did not exist in 1776. The land that forms the present southern end of the Isle of Palms accreted since 1776. In June of 1776, the southern tip of the Isle of Palms was about 1.3 miles further Northeast, in the vicinity of modern 10th Avenue. This would put the British camp, as shown on the map above, in the vicinity of modern 14th Avenue. In addition, the 1776 Northeastern tip of Sullivan’s Island was about .3 mile further East of its present location. This tip of Sullivan’s Island has eroded away to its modern shape and location. The Breach Inlet channel has also changed axis orientation from West-northwest – East-southeast to North – South for a total shift of about 70 degrees clockwise to its modern orientation. Taking these changes into account, the Inlet in 1776 was about 1.3 miles across, mostly shallow except for the 7′ channel as shown on the old map above. The two forces on land could only shoot at each other using cannons. I am new to the area after living 16 years in the Phoenix, AZ desert. Seeing water and history at the same time are such a treat! I stood on that spot with the signs about a week ago, sketching with the idea of making a painting. I was so impressed with the signs. The info above from Jack Parker really makes it come alive even more! I was in awe that I was standing where our very Independence was being won and July 4th was just a week away. You can see my art by Googling my name. The 8th virginia regiment fought in the battle at breach inlet from 5:00 pm till 9:00pm. I would like to see their efforts recognized. Particularly, Captain Thomas Berry of the eighth Va. Reg. They marched from Winchester VA. to Sullivan’s island without a single tent and many of them became sick due to the climate. Pat makes a good point. The 8th Virginia Regiment ceratainly contributed to the patriot victory. General Lee was impressed with Col Muhlenberg’s regiment and sent them to reinforce Col Thomson in the late afternoon of the 28th. Accounts vary about the number of troops (500-700), arrival time (5-8pm) and degree of participation (it appears they arrived after the crossings were repulsed but while skirmishing continued). Regardless of these details, the arrival of hundreds of reinforcements – in view of the enemy during daylight hours – would have helped deter further British attempts to cross. See details in the Timeline. Any additional information from primary sources is welcome. Great website! I’m particularly interested because an ancestor, Hugh Middleton, was a First Lieutenant in the Third Rangers at that time. I have found some evidence that he was at Sullivan’s Island with Thomson, but a return with his name on it would cinch it for me. Tim, I have not seen Hugh Middleton on any listing of those at Breach Inlet, but please let me know if you find evidence he was there so I can update the order of battle on this page. I have a pension application for Peter Hubbard of the 3rd SC that says he was in the battle at Sullivan’s Island in Samuel Wise’s Company of Col William Thompson’s Regiment. Do you have record of him there. Yes, you can see Peter Hubbard listed in the link on this page. 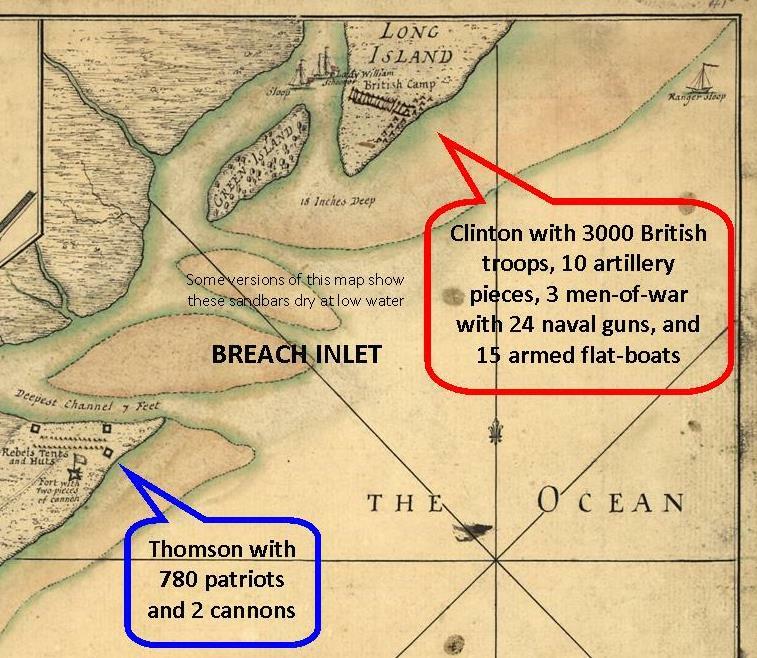 Click on Force at Breach Inlet – Patriot in blue type in the PATRIOTS AT BREACH INLET section above. Thanks to your site, I’ve been able to unravel a family mystery. My ages ago grandfather, Nicholas Prince [W8289], was at Sullivan’s Island. I’d been unable to pinpoint his likely position on the island during June 28, 1776 events until I saw his company (Capt. Snow) and name listed among SC militia at Breach Inlet. Prince, 18, had volunteered with the Craven County (Lower) militia the first of June, so he was a raw recruit when he was thrust into action at Thomson’s Battery. Thank you for the commentary and research. Can’t wait to share this with other Rev. War wonks in the family. Thank you so much for this site. I am trying to find out if my 6th great grandfather Dixon Pearce was at Breach Inlet?? I know he was in Samuel Wise’s company Thompson 3rd SC Rangers, I would really love to know if he was here. FA 1 03 . I think it was produced in Jan. 1903 from Frankford Arsenal in PA.